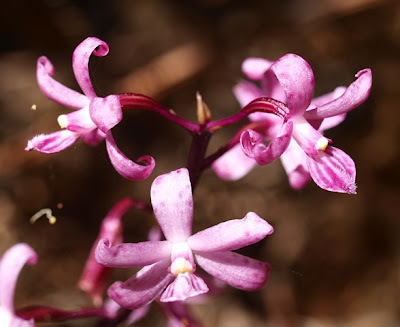 Since arriving in Australia on the 3rd of February I've seen one native Australian orchid. This is not the best time of year for orchid flowering and most of the local orchids aren't much to blog about when they are not in flower. Usually there is a single leaf, appearing only a few weeks before the flower. Not much to confirm their presence in high summer when only the craziest of orchids are doing their thing. In this particular case, the crazy orchid doesn't even have a leaf. It doesn't need one. Fungi do all the hard work feeding the plant from its roots so it can produce some of the gaudiest pink flowers in Australia. The fungi, mostly members of a family called Russulaceae, generally feed on living eucalypts. So it's the gum trees that give life to these strange blooms. 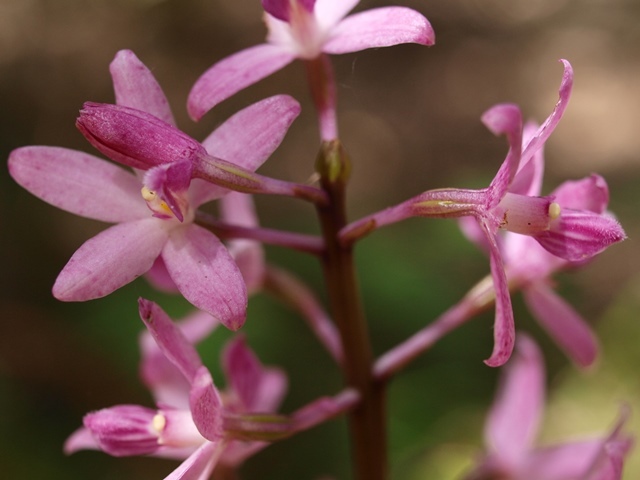 I'm not sure I find the Hyacinth Orchid attractive yet every time I see a Dipodium in flower I get excited. It's partly about the time of year when little else is flowers. Partly about the ridiculously strident flowering stalk and spotted pink flowers. Partly about all this spectacle without the bother of green leaves and photosynthesis. And partly that thrill that comes with every orchid discovery for those of us inflicted with something I will avoid calling orchitis (because that means something entirely different!). 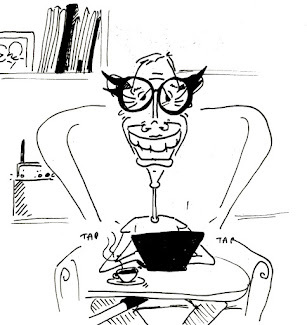 Orchid taxonomy can be like that and when I was writing up and editing orchids for the Flora of Victoria there was inevitably a variant from out the back of, let's say Cape Conran, where the spotting or the curving was just little different. While sceptical of some of the species described over the last few decades there was a lot of variety out there in the Australian bush hidden within rather vaguely applied names. 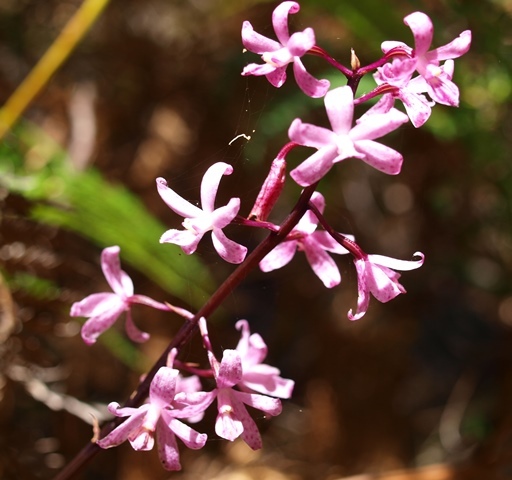 The species Dipodium roseum varies in colour and stature across the State but most of the distinctive forms have been stripped out and described as one of the six species of Dipodium now recognised in Victoria (there are 13 in Australia and 35 around the World). It includes most of what we used to call Dipodium punctatum around the time I first worked at Royal Botanic Gardens Melbourne. As we move into autumn next week I expect to find a few greenhood and bird-orchid leaves in wetter places but there won't be anything as pink, as extravagantly free-loading, and as welcome, as the Hyacinth Orchid until next summer. You are not alone in your love for orchids. Australia has the best! Although a specific species can have variations depending on location, I think that just adds to the appeal for more people and a higher interest. My favourite: Dendrobium phalaenopsis (cooktown orchid), the floral emblem QLD. Thanks James, quite right! And yes, the Cooktown Orchid is a good one.